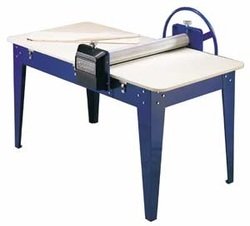 16" x 24" tabletop slabroller, with hand lever and thickness indicator to adjust slab thickness between 0-1". This travel-friendly option is lightweight (31 lbs) and portable. Comes with one set of canvas. 2-year manufacturer warranty. 30" x 50" table, 36" high. 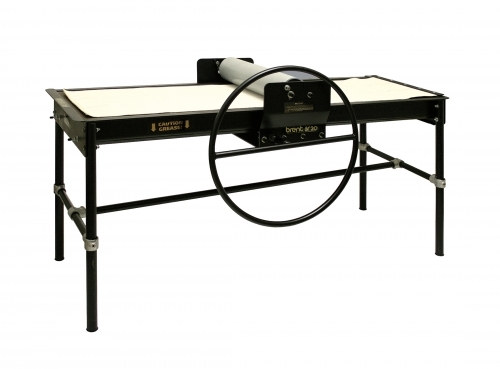 This slabroller features a wagon wheel handle, dual crank adjustment system with thickness indicator, and can roll slabs up to 3" thick. Comes with one set of canvas. Requires assembly. 1-year manufacturer warranty. 24" x 48" table. 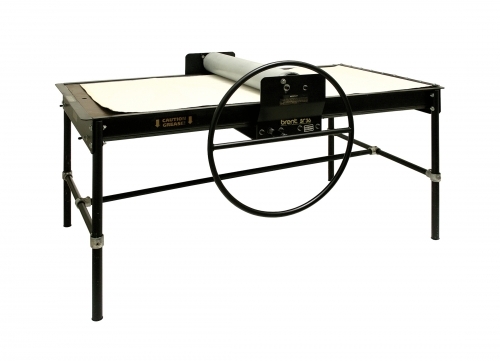 This slabroller can roll slabs up to 2 3/4" thick. Comes with one set of canvas. Requires assembly. 30" x 48" table. 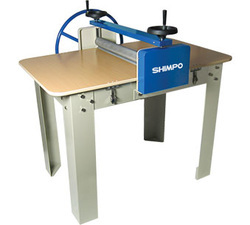 This slabroller can roll slabs up to 2 3/4" thick. Comes with one set of canvas. Requires assembly. 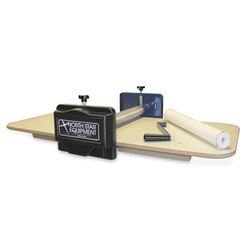 18" x 48" portable slab roller unit with handle and canvas. 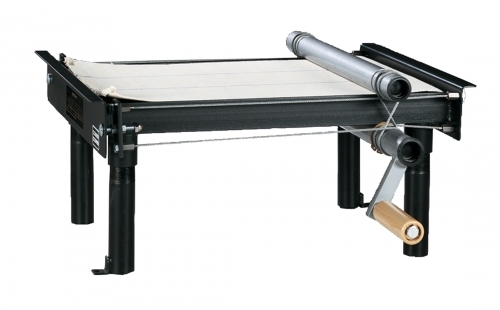 This slabroller can roll slabs up to 2 3/4" thick. 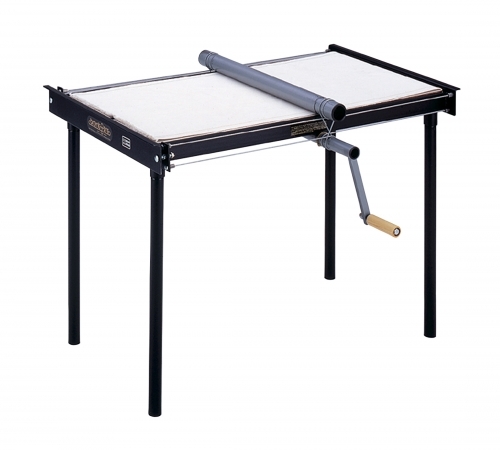 24" x 48" tabletop model. 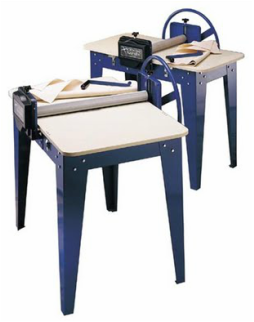 Easily mounts to a counter or worktable. 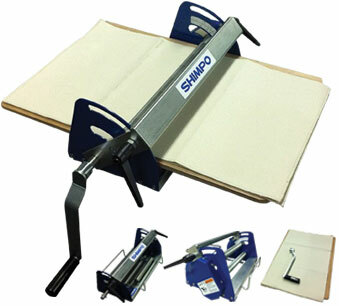 This slabroller can roll slabs up to 2 3/4" thick. Comes with one set of canvas and a crank handle. Requires some assembly. NorthStar's Super Series slabrollers are designed for heavy usage, in settings such as production studios, commercial settings, and university programs. These slabrollers feature 4" diameter rollers, 72" long tables, and include a canvas set and wagon wheel handle. These slabrollers have a maximum slab thickness of 2 1/4". Bodies and rollers are made of cast and carefully machined high-strength special alloy aluminum. Gears are made of the strongest material available for this application, nylon or steel. Bushings are nylon and the remaining parts (except plastic gear covers and knobs) are machined steel. Table frames are 14-gauge steel. Tabletops are of moisture-resistant Medex with a melamine surface. Metal surfaces are zinc plated or coated with a durable powder coat finish. Virtually no maintenance is required, and the simplicity of the design ensures that any repair ever needed will be quick and easy. 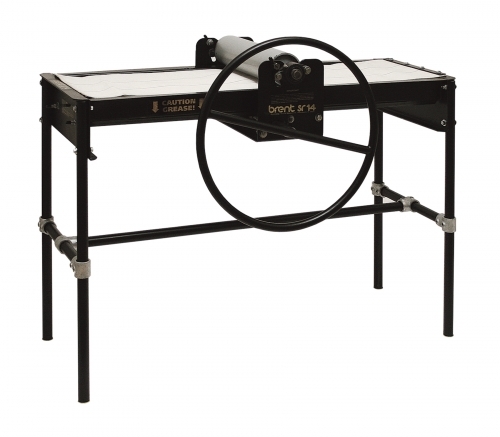 The SR-20 is a mid-sized floor model that can produce slabs up to 20"W x 52"L. It includes one 1/4" shim with canvas and one 1/8" plain shim. Maximum slab thickness is 1 1/2". Assembled dimensions: 34"W x 76"L x 40"H.